The chief minister failed in taking his bureaucracy along and instilling confidence in them after the alleged assault on chief secretary Anshu Prakash. 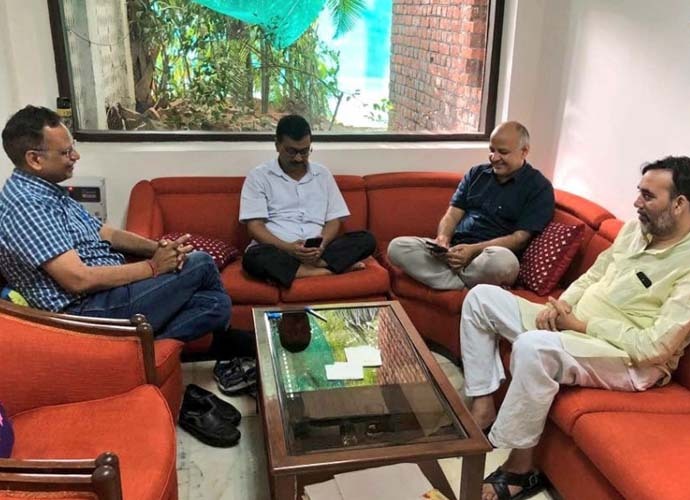 The sit-in of Delhi chief minister Arvind Kejriwal and his Cabinet colleagues at the office of the lieutenant-general (L-G) completes a week today (June 18). Last Monday, after a resolution demanding full statehood got adopted in the Vidhan Sabha, Kejriwal and his colleagues met L-G Anil Baijal at his office seeking his intervention in the alleged strike by IAS officers and have stayed put since. While Kejriwal is not new to such agitations and sit-ins, the latest crisis has been precipitated on account of an alleged physical assault of Delhi's chief secretary Anshu Prakash by a couple of Aam Aadmi Party(AAP) MLAs in the presence of Kejriwal. While that matter is sub-judice and looks like an open-and-shut case as the medical report and a witness statement of the chief minister's adviser under section 364 (to a magistrate) corroborates the version of Prakash, the fact that Kejriwal didn't offer an apology to his chief secretary made things worse. In fact, the AAP has been claiming that it's a false case. It was followed by the three associations of IAS officers passing resolutions to have only written communication with the political executive until Kejriwal tendered an apology. They also followed it up with more resolutions like observing five minutes' silence at the beginning of lunch hour every day and not visiting the camp offices or residences of members of the political executive. On Sunday (June 17), the IAS Association held an unprecedented press conference to deny the charges of going on strike as the AAP claimed and contended that they worked as usual. The chief minister held out an olive branch on Sunday evening when he tweeted an appeal to the IAS officers to get back to work with full vigour promising them safety and security. What can be concluded is that the chief minister failed miserably in taking his bureaucracy along and instilling confidence in them after the alleged manhandling of the chief secretary and this was an avoidable confrontation — unless there are ulterior motives involved. Kejriwal seems to be gambling on the appeal of agitation politics to recapture public imagination. Although it is true that the BJP government at the Centre has made life tough for the AAP government in Delhi, it was the setbacks in courts that have left the Delhi government in a state of crisis. On May 21, 2015, within three months of the Kejriwal government assuming charge, the central government issued a notification which effectively made L-G the exclusive authority on transfers and postings of bureaucrats. This was followed by a hue and cry and a slew of petitions by AAP in the high court. However, the Delhi HC in August 2016 delivered a verdict which once again dealt a blow to Kejriwal. The Delhi High Court held that state was only a Union Territory and that the chief minister and Cabinet couldn't take policy decisions — even on matters where the legislative Assembly has the power to make laws — without the concurrence of the L-G. The Delhi government was left in the unenviable position of having the authority to legislate, without the authority to execute these laws (Without L-G's consent). "On a reading of Article 239 and Article 239AA of the Constitution together with the provisions of the government of National Capital Territory of Delhi Act, 1991 and the Transaction of Business of the Government of NCT of Delhi Rules, 1993, it becomes manifest that Delhi continues to be a Union Territory even after the Constitution (69th Amendment) Act, 1991 inserting Article 239AA making special provisions with respect to Delhi," the HC verdict read. This HC order also held that the multiple inquiry commissions Kejriwal commissioned were illegal. That was another blow as the one-man inquiry committee of Gopal Subramanian — constituted to probe the DDCA scam involving Arun Jaitley — had also to be disbanded. This inquiry commission was Kejriwal's deterrent and the ace he held against Arun Jaitley's defamation suit. The verdict in turn led to a meek apology when it became clear that he would risk going to jail otherwise. The HC order was challenged in the Supreme Court and the verdict by a Constitution bench was reserved in December 2017, following the culmination of the trial. This protest, at a time the verdict in the Constitution Bench challenge is awaited (following the summer break), smacks of desperation or is clearly aimed at gaining political capital. Despite his legitimate grouse against the central government for making life tough for him, the ball is actually in the court of the Supreme Court now. And this sit-in at the L-G's office has very little to do with either the central government or the courts. A section of intellectuals has already come out in unison backing the AAP protest. It got further mileage when four regional chief ministers led by West Bengal CM Mamata Banerjee expressed their solidarity and sought a meeting with Kejriwal on June 16. The press conference held by the chief ministers in the national capital helped Kejriwal's protest gain legitimacy among the wider public and grab eyeballs across the nation. The question everyone's been asking is why Congress hasn't backed Kejriwal. Some people lay the blame on Delhi Pradesh Congress Committee chief Ajay Maken's door even as they sought to inculpate Rahul Gandhi for ignoring the larger picture. The question is why is Opposition unity always predicated on Congress' accommodation? By the way, people have short memories. Does anyone recall how a magnanimous Congress propped up newbie AAP in 2013 when they fell short of majority? Would any other party be magnanimous enough to offer such an unconditional support to an abusive ally? As for the present situation, it is completely the doing of Kejriwal that a mere apology could solve. Why should anyone else stick up for the AAP to defend them on this self-inflicted crisis? Congress has many faults but it doesn't have to get subsumed by the regional parties and take the fight to straight to the BJP as some people tend to believe. There is a bigger question the liberal intelligentsia backing AAP has to answer. What did Kejriwal mean when he stated on the floor of the legislative Assembly that he would campaign for the BJP if Delhi was granted full statehood before 2019? That certainly didn't seem like rhetoric. And what happened to Opposition unity then?